Designed for first-in-last-out storage, this rack slides loads to the rear on inclined rails fitted with resin rollers. It optimizes high frequency picking of random items and cases. Travel distances and operations required for loading and unloading are shorter, which helps to minimize picking mistakes. Picking efficiency of a wide variety items stored in small volumes can be further enhanced when used in conjunction with conveyors, picking carts and digital indicators. Uses: Distribution centers for consumer products such as foods, pharmaceuticals and sundries, parts factories for cars, machinery and electric equipment, etc. 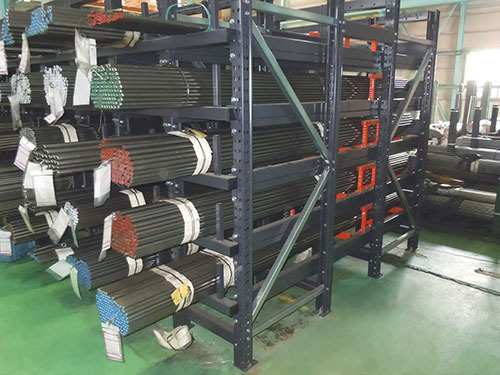 This rack stores lumber, structural steel, piping and other long items. 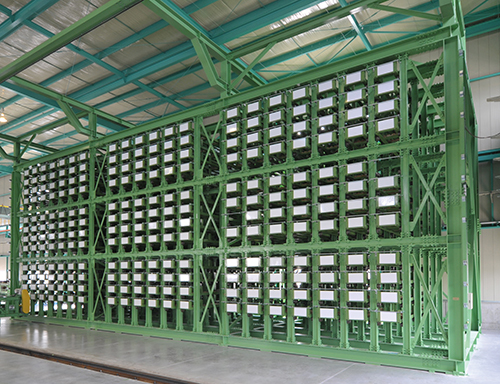 It efficiently stores and enables smooth loading and unloading of long items that exceed pallet sizes. 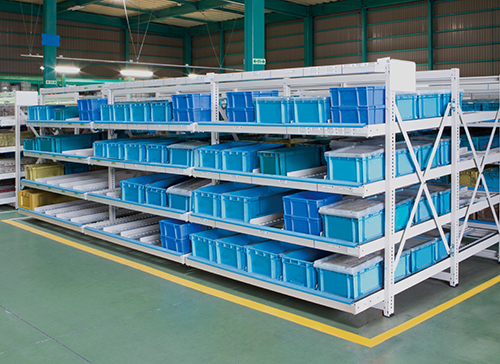 Racks can be built to accommodate stored stock by combining arms, supports and frames of the required size. Uses: Factories that use lumber, piping, structural steel, rolled materials, etc. Heavy items can be easily stored using cranes or hoists. The rack is available in a 500 mm half stroke type and 800 mm full stroke type. Uses: Factories that use molds, production engineering sites, etc. This rack is specifically designed for storing small and medium size molds. Molds can be stored and retrieved using a hand lift as shelves slide in and out. C-shaped supports that resist twisting are used. This stationary rack stores drum cans much more efficiently. 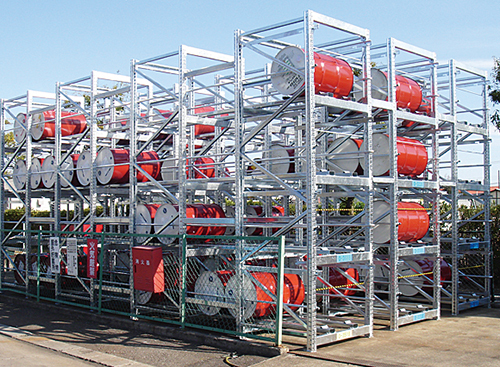 Drum cans can be stored vertically, thus enabling high volume storage in tight spaces. 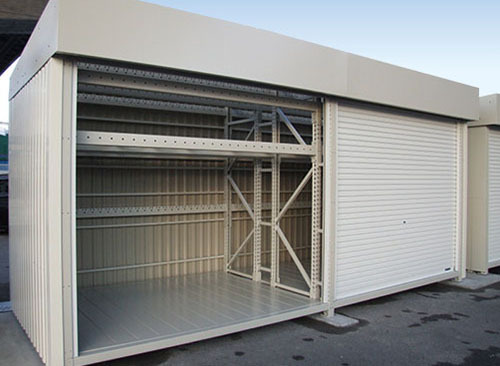 Sturdy construction ensures safe storage and easy loading and unloading. Uses: Factories that use fuels, paints, solvents, distribution centers, etc. 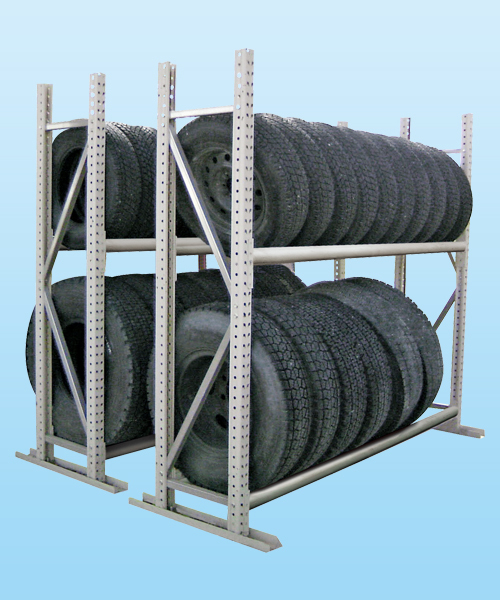 This rack stores tires for ordinary cars and trucks much more efficiently. The simple sturdy structure is based on a pallet rack and can be assembled in a short amount of time, so that users can put it to work immediately. The rack is anchored to the floor to prevent falling. If anchoring is not possible in the place of use, an optional fall prevention base can be used to ensure that the rack stands stably. facilities that require spare tires, etc. This automatic rack is specifically designed for storing long and heavy bar. This fixed rack is specifically designed for storing long and heavy bar. This shutter rack is made of components of pallet rack.